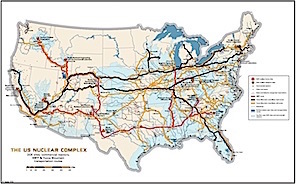 Click the image to download this large printable map of DOE sites, commercial reactors, nuclear waste dumps, nuclear transportation routes, surface waters near sites and transport routes, and underlying aquifers. This map was prepared by Deborah Reade for the Alliance for Nuclear Accountability. 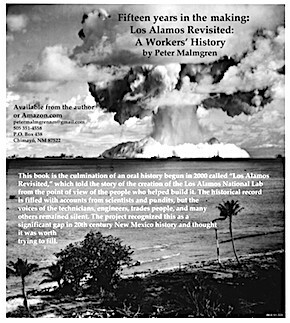 In a declassified memorandum dated June 29 1950, the AEC's Walter Hamilton wrote: "The profits which might be gained by moving out of Los Alamos now might be more top scientists in the project, faster progress on weapons research projects, and financial economies which would free dollars for bombs instead of water wells and golf courses for Los Alamos. It's worth thinking about!" 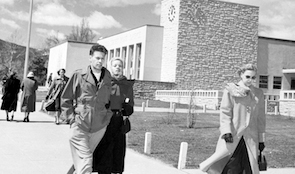 The Los Alamos National Laboratory (LANL) in north central New Mexico was originally founded during World War II as the secret atomic weapons lab for the Manhattan Project. This wartime effort culminated in the "Trinity Test", the first atomic explosive device, detonated near Alamogordo, New Mexico on July 16, 1945, which was followed by the bombs dropped on Hiroshima and Nagasaki, Japan on August 6 and 9, 1945. After the war Los Alamos developed nuclear weapons, the modern 'H-bombs'. Currently, five of the seven warhead types in the planned enduring stockpile are LANL designs. These are the B61 gravity bomb, the sub-launched W76, the W78 for intercontinental ballistic missiles, the W80 for sea-launched cruise missiles and the sub-launched W88. The Business of Bombs: The University of California (UC) managed Los Alamos since the Lab's inception in 1942. However, in June 2006 Lab management was taken over by Los Alamos National Security, LLC; a for-profit corporation of partners that includes Bechtel National, UC, Babcock & Wilcox and URS. LANS LLC makes around $83 million in annual award fees (ten times UC's past fees). Overhead on LANL programs is just under 50% annually. 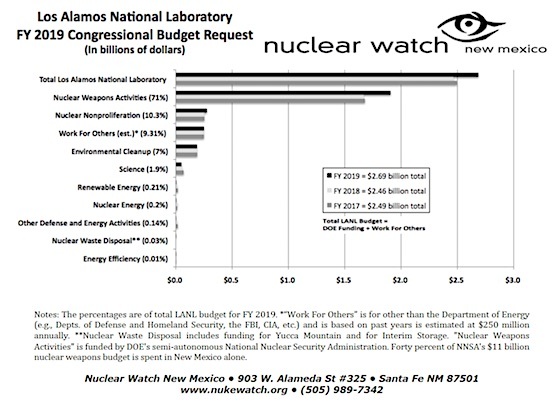 Despite public and political rhetoric about mission diversification at Los Alamos, funding for its nuclear weapons programs continues to be the overwhelmingly dominant budget item. 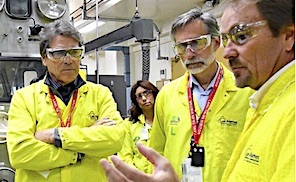 The DOE has requested $1.9 billion for LANL in fiscal year 2013, of which $1.3 billion is for core nuclear weapons research and production programs (68% of the DOE request). There will be an estimated $300 million in funding from non-DOE sources, bringing the Lab's total institutional budget to around $2.2 billion (now surpassed by the Sandia Labs), of which 60% is directly for nuclear weapons, while many other programs indirectly support LANL's nuclear weapons programs. - Research, design, development and simulated testing of nuclear weapons. - Nuclear weapons Life Extension Programs. - Limited production of plutonium pits (currently approved for up to 20 per year). - Manufacture of nuclear weapon detonators for the stockpile. - Capabilities for R&D and fabrication of enriched and depleted uranium components. - Assessment and certification of stockpiled nuclear weapons. - Tritium (radioactive hydrogen used to boost nuclear weapons) and high explosives R&D. - Explosive hydrodynamic testing of surrogate plutonium pits. LANL's Plutonium Complex: LANL's Technical Area-55 hosts Plutonium Facility-4 (PF-4), the only fully functioning plutonium facility in the US for pit production. These fissile pits are themselves atomic bombs, now used as the first stage or "primary" to trigger fusion in the "secondaries" of modern thermonuclear weapons. Within TA-55 and contiguous to PF-4 is the newly built first phase of the Chemistry and Metallurgy Research Replacement (CMRR) Project, the "Radiological Lab," and, if built, the future and highly controversial CMRR "Nuclear Facility". The CMRR-Nuclear Facility controversy is ultimately about future mission diversification (or not) at LANL. 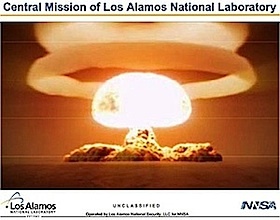 Los Alamos should be diversifying its missions rather than further investing in the shrinking nuclear weapons business. Then perhaps the Lab could help better meet today's national security challenges, such as nuclear weapons proliferation, global climate change and energy dependence. In contrast, building the Nuclear Facility will further mortgage LANL's future to the receding nuclear weapons industry. Some Brief Socioeconomics: According to 2010 Census Bureau data Los Alamos County's population is 76.3% "white persons, not Hispanic," while New Mexico is the only state with a 'minority' majority (59.5% of the state's population). Out of 3,142 counties in the country, Los Alamos County had the 2nd highest median household income. New Mexico has the fourth highest poverty rate in the country and the highest percentage (25.8%) of children living in poverty, while Los Alamos as a county has the lowest poverty rate in the country. Out of 50 states NM ranked 43rd in per capita income in 2010 ($33,267), down from 37th in 1959, despite the vaunted economic presence of the nuclear weapons industry in New Mexico. Dark Legacy: Secret Cold War nuclear weapons activities have left a widespread legacy of contamination. Estimates for cleanup of this radioactive and hazardous waste contamination at LANL range from $2 to $30 billion or more. This wide spread has to do with the type of cleanup that the New Mexico Environment Department (NMED) will ultimately approve, following a public comment process, which ranges from 'cap-and-cover' to exhumation. DOE legally committed to cleanup decades worth of contamination across the Lab's 37-square-mile property by 2015 when it signed a Consent Order with the New Mexico Environment Department in March 2005. Precious taxpayer funds should be used to meet those cleanup obligations, not to build unneeded, new nuclear weapons production facilities. Why is LANL Building BioSafety Level 3 Labs? "Los Alamos National Laboratory is pushing forward a 2001 plan to build BSL-3 labs to work with disease germs like anthrax and tuberculosis, even though Los Alamos has not adequately explained what the facility would be used for or why it is needed, according to a report released last week by Department of Energy Inspector General Gregory Friedman. "Richard Ebright, a professor of chemical biology at Rutgers University and a laboratory director at the university's Waksman Institute of Microbiology, said the DOE in particular has 'no mission that is relevant in any way, shape or form, directly or indirectly, to biological weapons agents. It has no need, directly or indirectly' for a BSL-3 lab." Read the CPI report: Growing Number Of Biosafety Labs Raises Public Health Concern. The National Nuclear Security Administration's own documents have explicitly stated that expanded pit production would have no significant positive effect on job creation and the regional economy of northern New Mexico. Nuclear Watch argues that expanded plutonium pit production could actually have negative effect if it blocks other economic alternatives such as comprehensive cleanup, which could be the real job producer. Moreover, given LANL's poor safety and environmental record, expanded plutonium pit production could have a seriously negative economic impact on northern New Mexico in the event of any major accidents. Los Alamos National Laboratory Director Charles McMillan, who has overseen New Mexico's largest scientific complex for six years amid a growing budget and expanded nuclear weapons work- but also at a time of numerous safety troubles at the lab, told his staff Tuesday morning that he will retire at the end of the year. The announcement comes during a transition to a new operator for the lab and in the wake of a federal investigation and congressional calls for more scrutiny regarding safety at LANL. Jay Coghlan, director of the watchdog group Nuclear Watch New Mexico, said, "We like to call him McMillion for the annual paycheck he was receiving while running the lab into the ground with an exploding radioactive waste drum at the Waste Isolation Pilot Plant and ongoing nuclear safety lapses at Los Alamos plutonium facility." The lab's contract was put out for bid in late June, and the lab will be under new management by September 2018. 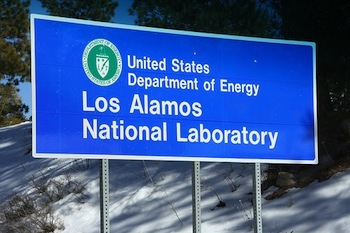 Coghlan and others, including the University Professional and Technical Employees Union, have questioned the for-profit management model at the lab, which began when Los Alamos National Security was hired in 2006 to run LANL. The transition to for-profit management led to a jump in the labs annual budget and a significant boost in the directors annual salary. "He's the poster child for why the profit motive should not run nuclear weapons facilities," Coghlan said. 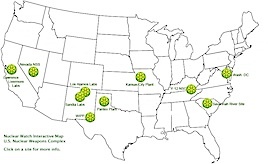 Santa Fe, NM -"The Washington Post has begun publishing a series of articles on nuclear safety lapses in plutonium pit production at the Los Alamos Lab. Plutonium pits are the fissile cores of nuclear weapons that when imploded initiate the thermonuclear detonation of modern weapons. "Why expand plutonium pit production when apparently it can't be done safely and may decrease, not increase, our national security? One strong reason is the huge contractor profits to be had under the one trillion dollar-plus 'modernization' of the nuclear weapons stockpile and production complex initiated under Obama, which Trump promises to expand. Far from just 'modernization', existing nuclear weapons are being given new military capabilities despite denials at the highest levels of government..."
First in the series "Nuclear Negligence", by Patrick Malone and R. Jeffrey Smith for the Center of Public Integrity. Simultaneously published in the Washington Post. "Los Alamos violated nuclear industry rules for guarding against a criticality accident three times more often last year than the Energy Department's 23 other nuclear installations combined, that report said. Because of its shortcomings, federal permission has not been granted for renewed work with plutonium liquids, needed to purify plutonium taken from older warheads for reuse, normally a routine practice." "Moreover, a year-long investigation by the Center makes clear that pushing the rods too closely together in 2011 wasn't the first time that Los Alamos workers had mishandled plutonium and risked deaths from an inadvertent burst of radiation. Between 2005 and 2016, the lab's persistent and serious shortcomings in "criticality" safety have been criticized in more than 40 reports by government oversight agencies, teams of nuclear safety experts, and the lab's own staff." 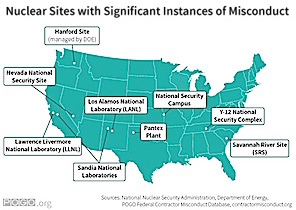 "And these safety challenges aren't confined to Los Alamos. The Center's probe revealed a frightening series of glaring worker safety risks, previously unpublicized accidents, and dangerously lax management practices. The investigation further revealed that the penalties imposed by the government on the private firms that make America's nuclear weapons were typically just pinpricks, and that instead the firms annually were awarded large profits in the same years that major safety lapses occurred. Some were awarded new contracts despite repeated, avoidable accidents, including some that exposed workers to radiation." First in the series "Nuclear Negligence" by Patrick Malone for the Center of Public Integrity. Simultaneously published in the Washington Post. * Statement from Frank Klotz, NNSA Administrator, regarding the CPI article and series. "Jerry McKamy, a former NNSA nuclear physicist and now a senior expert at the Defense Nuclear Facilities Safety Board, ...made it clear in a trade journal article last December that the nuclear complex's poor handling of criticality safety has been endemic." "McKamy wrote that 'DOE and its contractors have repeatedly shown they are not capable of anticipating and preventing serious criticality safety problems.' They have persistently ignored 'written and credible warnings by criticality safety and management experts.'" Available from the author, Peter Malmgren, petermalmgrennm@gmail.com and (soon) at Amazon. A recent fire has put a national laboratory's ability to operate safely into question. The Defense Nuclear Facilities Safety Board announced Friday that it will hold a hearing next month to discuss the future of the Los Alamos National Laboratory, the Santa Fe New Mexican reported. The board is an independent panel that advises the U.S. Department of Energy and the president. A fire broke mid-April at the lab's PF-4 plutonium building, where the plutonium cores of nuclear weapons are produced. Lab officials said that the fire was put out quickly and caused only minor injuries. Defense Nuclear Safety Board public hearing. In the wake of the plutonium building fire last month, questions of risk and safety as LANL prepares to accelerate plutonium pit fabrication. 5:00pm to 9:45pm, 201 West Marcy Street. 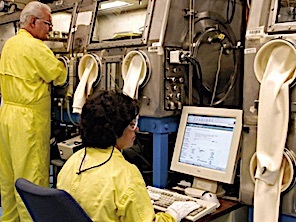 Jay Coghlan, Nuclear Watch Director, commented, "Expanded plutonium pit production at the Los Alamos Lab is really all about future new-design nuclear weapons with new military capabilities produced through so-called Life Extension Programs for existing nuclear weapons." "...The electrical accident was the latest in a string of problems for LANS that include injured workers, improperly handled hazardous waste, missing enriched uranium, stolen tools and the public release of classified documents. The most costly incident occurred in 2014, when a container of radioactive waste repackaged at the lab later ruptured in the nation's only underground nuclear waste repository, contaminating workers and costing hundreds of millions of taxpayer dollars to clean up. LANS failed to get the award term, a condition DOE had set for continuation of the LANL management contract beyond 2017. Low marks in the Operations and Infrastructure category sunk LANS chances for the award term. In the fall of 2014, the Department of Energy's Inspector General published a scathing report on failures and cover-ups at LANL in the handling of radioactive waste for shipment to WIPP that resulted in the leak and site closure, for a DoE-estimated total cost of $500 million. - Nov. 18: A detailed investigation by the Santa Fe New Mexican: "LANL officials downplayed waste's dangers even after leak"
Nov.1, 2016. "Home to the scientists who built the nuclear bomb, the company town of Los Alamos, New Mexico is today one of the richest in the country- even as toxic waste threatens its residents and neighboring Española struggles with poverty." A special "cities" report from The Guardian. "If atomic bombs are to be added to the arsenals of a warring world, the time will come when mankind will curse the names of Los Alamos and Hiroshima." -Robert Oppenheimer, Director, Manhattan Project, acceptance speech, Army-Navy "Excellence" Award Nov. 1945 Our Mission: Through comprehensive research, public education and effective citizen action, Nuclear Watch New Mexico seeks to promote safety and environmental protection at regional nuclear facilities, mission diversification away from nuclear weapons programs, greater accountability and cleanup in the nation-wide nuclear weapons complex, and consistent U.S. leadership toward a world free of nuclear weapons. Nuclear Watch New Mexico is supported by the Ploughshares Fund: Investing in Peace and Security Worldwide, the Windfall Foundation, Santa Fe Community Foundation Donor Advised Grants, the New Mexico Community Foundation, the New-Land Foundation, and by generous donors like you. Thank You!